One of the benefits of a vegetarian diet is a reduction in your impact on the environment. 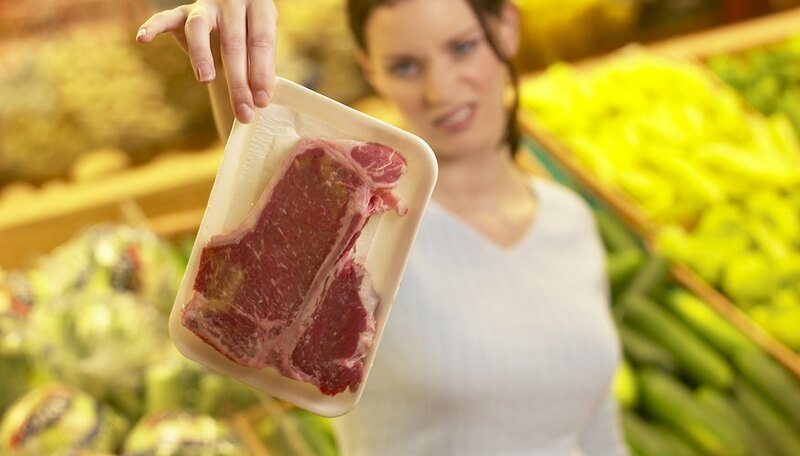 Animals store only a small fraction of the energy they extract from the food they eat, and the rest is wasted as heat. If you eat animal foods, most of the energy in the plants those animals ate has been lost as heat and only a fraction of it reaches you. Eating plants is more efficient, meaning that less of the energy the plants contain is wasted. Ultimately, this means that less land is required to support a population of vegetarians. A food chain is the sequence of who eats whom in a given environment. Sheep, for example, eat grass and are eaten by wolves in turn. Your trophic level is your position on the food chain, which determines how much energy you require. Producers -- organisms that harvest energy from sunlight -- occupy the first trophic level, the lowest position on a chain. Herbivores that eat the producers are considered the second trophic level, while carnivores that eat herbivores are the third level. Carnivores that eat other carnivores -- like sharks that eat seals -- are the fourth trophic level. Food chains in nature are more complicated than this model suggests, of course; most more closely resemble a web than a chain, because each organism may have many different kinds of organisms it can eat. Grizzly bears, for example, eat both plant matter like berries and roots and animals like fish and insects. All of the energy in most food webs on Earth originates as sunlight. Producers like plants on the first trophic level convert the sunlight they capture into chemical energy. This stored energy is extracted by herbivores on the second trophic level, who use it to sustain their own growth. Carnivores on the third and fourth trophic levels in turn extract stored chemical energy from the herbivores and carnivores they eat. In other words, energy travels upward through the food chain. Any time an organism eats another organism, it is extracting and converting stored chemical energy into a form it can use. The Second Law of Thermodynamics is an important law of physics, dictating that no energy conversion can be 100-percent efficient. In other words, every time you transform or convert energy from one form to another, some of that energy is lost in the form of waste heat. In general, roughly 90 percent of stored energy is lost as waste heat each time you go up the food chain by one trophic level. In other words, animals, on average, convert just 10 percent of the energy available from the organisms they eat into stored chemical energy. Eating lower down on the food chain provides a massive savings in terms of how much energy and resources you need. If you're on the third trophic level and you eat herbivores, the animals you eat contain only 10 percent of the energy originally stored by the plants they consumed. This means you require somewhere close to 10 times more plant mass to support you than someone who just eats plants. Conversion efficiencies in food webs vary, so this is a rough estimate. However, in general, eating lower on the food chain is always a more efficient practice. 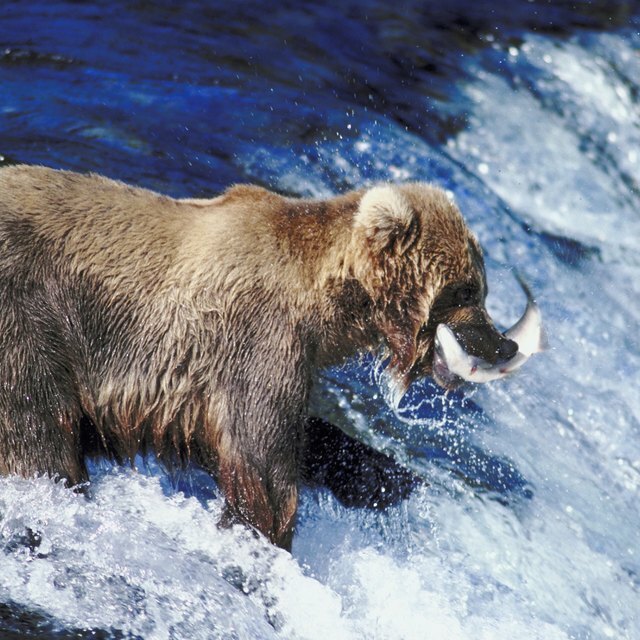 US Fish and WIldlife Service: What Do Grizzly Bears Eat? Brennan, John. "How Does Being a Vegetarian Conserve Overall Energy in Trophic Levels?" Sciencing, https://sciencing.com/being-vegetarian-conserve-overall-energy-trophic-levels-3342.html. 25 April 2017.